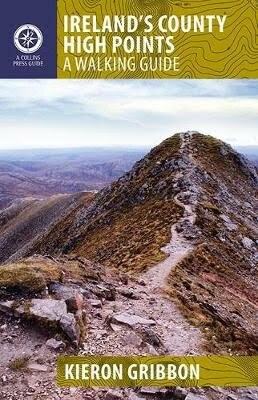 This is the first-ever walking guidebook devoted exclusively to the County High Points (CHPs) of Ireland. A CHP (also referred to as a County Top or County Peak) is, quite simply, the highest place within a specific county – these terms are also used in Great Britain and the USA where County High-pointing has already established itself as a popular hill walking challenge. Ireland's County High Points - A Walking Guide was by far the most talked-about Irish walking guidebook during its first year of publication in 2012, and continues to receive high praise from the media (see "In the Media" for publicity and reviews the book has received). Ireland's County High Points - A Walking Guide does exactly what the title says. 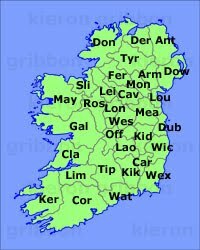 In a nutshell, the book is a highly-illustrated "how to get there and back" set of instructions for anyone wanting to become the 'geographically' highest person in any of Ireland's counties. I had considered including details of geology, flora, fauna, folklore, placename translations, etc, but discovered early in the project that this additional information on an all-Ireland level could easily double the thickness of the book. I chose to focus on writing a practical guide to walking Ireland's CHPs which provides hill walkers with all the relevant information they need. Published by The Collins Press in March 2012, the book is set to become the essential guide for County High-pointers in Ireland. Each of the book's thirty-two chapters introduces a different Irish county before getting into the all-important walking routes. For the serious challenger, inter-walk driving routes have also been included for all the various multi-site CHP challenges which can be undertaken in Ireland. I am particularly proud to have personally created every element of this guidebook, including maps for all walking routes featured (a skill possessed by very few outdoor writers and photographers). Although it fits neatly on the bookshelf among the other titles which comprise the 'A Walking Guide' series published by the Collins Press, Ireland's County High Points - A Walking Guide is distinctly unique. Instead of being a local or regional guide, the book is the first (and only) official walking 'challenge' guide available for Ireland. While readers of other walking guides will typically sample less than half of the routes featured in those publications, readers of Ireland's County High Points - A Walking Guide are likely to make a point of doing all routes in order to complete the built-in challenge. Ireland's County High Points - A Walking Guide also has the honour of being the first Irish walking guidebook to provide start point coordinates in a variety of formats specifically to suit the wide range of in-car satnav units available. It is currently the only Irish walking guidebook to provide this information, although it is likely that all future publications will eventually follow this trend. I completed my own All-Ireland CHP challenge in April 2011 as part of the fieldwork research for this book. All walking, surveying and photography for the project was completed over a period of ten months, during which I was fortunate to have experienced clear viewing conditions from all CHPs. I now look forward to revisiting every Irish CHP before the end of 2014 - where possible, it is my intention to visit each CHP as part of an organised walking festival or challenge walk (see list of organised CHP walking events). Further updates related to this guidebook will be announced here and on Facebook and Twitter. This book also has its own Facebook page, where you are invited to upload a photo of yourself (with the book) taken at a County High Point. This is becoming a popular trend for dedicated County Highpointeers. Alternatively, you can email your "Book on Tour" photos to mail@kierongribbon.com if you would like to have them added to the website.